Chicken breast, tomato, mature cheddar cheese, seasoned mayonnaise, smoked sweetcure streaky bacon and lettuce on oatmeal bread. 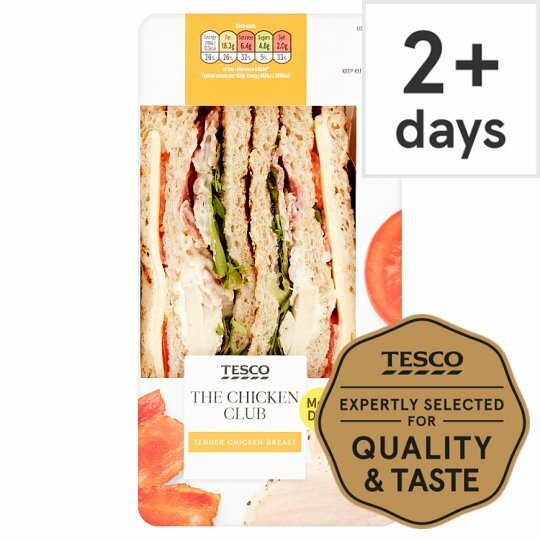 "Tesco THE CHICKEN CLUB Layered with smoked bacon, mature Cheddar and tomato on toasted bread Our chefs create recipes using ingredients specially selected for flavour. These ingredients are expertly layered into bread straight from the bakery to make our sandwiches, which are then carefully packed by hand." INGREDIENTS: Wheat Flour (Wheat Flour, Calcium Carbonate, Iron, Niacin, Thiamin), Chicken Breast (20%), Tomato, Water, Mature Cheddar Cheese (Milk) (9%), Smoked Sweetcure Streaky Bacon (4.5%) (Pork Belly, Sugar, Salt, Emulsifier (Sodium Triphosphate), Honey, Preservative (Sodium Nitrite)), Lettuce, Oatmeal, Rapeseed Oil, Wheat Bran, Cornflour, White Wine Vinegar, Salt, Yeast, Pasteurised Egg Yolk, Wheat Protein, Spirit Vinegar, Emulsifiers (Mono- and Di-Glycerides of Fatty Acids, Mono- and Di-Acetyl Tartaric Acid Esters of Mono- and Di-Glycerides of Fatty Acids), Mustard Flour, Black Pepper, Malted Barley Flour, Garlic Powder, Palm Oil, Flour Treatment Agent (Ascorbic Acid), Sunflower Oil.